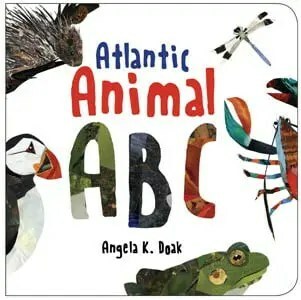 Here’s a new baby board book from Nimbus Publishing with collage illustrations of Atlantic Canada wildlife from A to Z.
Angela Doak is a collage artist and photographer. All of her work is done first as collage, made up of fabric, candy and gum wrappers, misprints, junk mail, and just about anything else that fits the image she’s making at the time. She lives in Halifax, Nova Scotia, with her husband and two children.